Hyssop, Hyssopus officinalis, makes a good tasting tea to treat colds. Anti-viral and expectorant. The leaves are used as a flavouring and as a salad herb. Bees are attracted to the blue, pink or white flowers produced in the spring and summer. A companion plant. 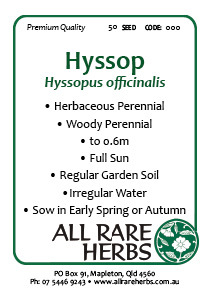 Hyssop is a native of Southern Europe and prefers light, well drained soils in a protected, shaded position. Drought and frost resistant. An evergreen shrub, growing to 0.6m x 0.5m. Be the first to review “Hyssop, seed” Click here to cancel reply.